Anyone who knows me well has heard me award a "gold star" to those who go above and beyond, do the hard thing, or just accomplish the ordinary in the face of difficult-to-manage circumstances. 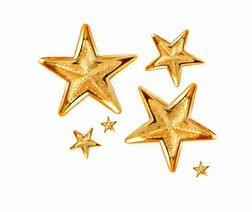 I give out gold stars to all three daughters for the work they do and the inspiration they are, two as mothers and one as a college student. I appreciate the people who serve our communities and make the world a better place every single day. Everyone is encouraged when their hard work and efforts are recognized. We all need a pat on the back once in a while. Over Christmas, one of my girls went through a couple of bins filled with her childhood treasures. It was fun to reminisce as she lifted out the bronzed baby shoes I had saved, her baby blanket, a doll or two, and outfits she had made in 4-H sewing class. She discovered trinkets, handmade cards, and school papers. And she found awards . 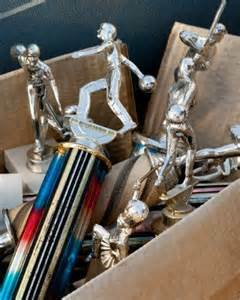 . . soccer trophies and plaques with her name, the year, and the event engraved on brass plates along with certificates, and blue ribbons . . . in a sense, all gold stars recognizing her efforts, good work, and exemplary character. I bet you have a few medals, trophies, or awards hanging around. Specifically, what were they for? What circumstances surrounded each one? The fact that you still have them shows they meant something to you, at least for a while. Maybe it's time to gather the family around, dust these "gold stars" off, and tell the stories that often lay buried in forgotten boxes in the attic. This week, I received an email containing an award. It read: "We are excited to announce that the book Penned Without Ink has won the Bronze/3rd Place Award in the 2017 Feathered Quill Book Awards Program for the Best Inspirational category! Congratulations! We had a HUGE response to our annual awards program, with many excellent books vying for top places. Your title rose to the top and you should be quite proud." Imagine! A shiny gold star in my inbox! And then I took time to remember all the people who helped Penned get on its feet . . . my family, my writers' group, the faculty at the Montrose Christian Writers Conference, the staff from Lighthouse Publishing of the Carolinas, those who endorsed and influenced and shared and prayed and supported and ordered and read and reviewed the book . . . Thank YOU for your part in this project. I'm giving out gold stars by the handfuls today. But the brightest gold star goes to the God who flung the first stars into the sky and said, "It is good." Oh, Sarah. Congratulations! This piece is lovely. God has given you skills you've honed to become a master writer. Blessed. I'm sure you can relate to this with raising two boys, your own career, and even your dad's service to our country . . . lots of "gold stars" along the way. Thanks for the encouragement. Congratulations, Sarah, and (as you said, in other words), all glory to Him who made and hung the stars. I know your parents (our sweet friends from FBC Marilla, "many moons ago") did a wonderful job investing spiritually in your life. Your writings are always timely and so well done and they do bring honor to our Lord. Keep up "the Good Work" for His glory. Thank you, Steve, for your encouragement. I mentioned your name to my dad. He remembered you. Blessings to you in your ministry. God bless you, Sarah! What an honor to receive a book award - Congratulations! I'll admit I'm not surprised though. Penned Without Ink is certainly deserving of it! You were my inspiration for entering PENNED in a couple of book award programs. Thank you for your continued support along the way.